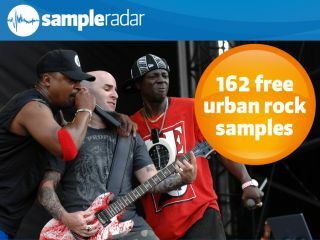 Public Enemy's Chuck D and Flavor Flav and Anthrax's Scott Ian do the hip-hop/rock thing on stage in 2007. Rock/hip-hop crossovers have been invading the charts since Run-D.M.C and Aerosmith pretty much invented the genre with their reworking of the latter band's hit Walk This Way. And now said genre - or should that be fusion of genres? - is hitting SampleRadar, as we present a collection of sounds that we're choosing to bill as urban rock. The urban rock samples are supplied in a zip file, so you'll need to extract them before you can see them. Enjoy!